Key difference: The Samsung Galaxy Note 8.0 aims at filling the gap between the Galaxy Note II and the Galaxy Note 10.1. The Galaxy Note 8 features an 8 inch TFT capacitive touchscreen with a resolution of 800 x 1280 pixels. The device is powered by a Quad-core 1.6 GHz Cortex-A9 and 2 GB of RAM. The device runs on Android OS, v4.1.2 (Jelly Bean). The Galaxy Tab 2 10.1 is a 10.1-inch tablet that was launched in May 2012. The tablets sports a Plane Line Switching (PLS) TFT capacitive touchscreen with approximately 149 ppi density, making the resolution on the screen not that great. The Wi-Fi model is powered by 1 GHz Dual-core Cortex-A9, while the Wi-Fi + Mobile model is powered by 1.5GHz, Dual-core Krait Qualcomm processor. 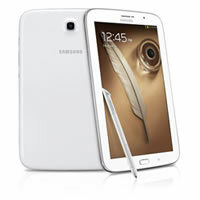 Following the launch of the Samsung Galaxy Tab 2 7.0, Samsung also needed a tablet for competing in the 10-inch tablet market. 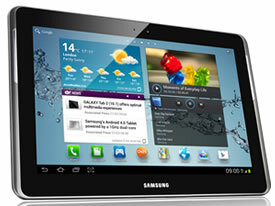 Lo and behold it launched the Samsung Galaxy Tab 2 10.1, which shares many similarities to its little brother. Similar to the Tab 2 7.0, the company launched two models of the Tab 2 10.1: Wi-Fi only and Wi-Fi + Mobile. The Wi-Fi and Wi-Fi + Mobile are quite identical in looks and also have similar hardware under the hood. The only differences between the two are the processor speed, OS and the camera features. The two different models allow the consumer to have the choice of either having only Wi-Fi or Wi-Fi + Mobile capabilities and pay accordingly. The Galaxy Tab 2 10.1 is a 10.1-inch tablet that was launched in May 2012. According to many review websites, the tablet has been a bit of a letdown compared to the original Tab 10.1. The company has completely shifted the focus of the tab and has even downgraded some of the features. To some it is worth the price, while the others are willing to shell out a little extra if the features are up to mark. The company has managed to keep the slim and sleek design of the device, which is one of the many good features of the Tab. The chassis is plastic and is available in brushed Titanium Grey, giving it a metal look. The speakers have been moved to the front of the screen and placed between the bezel and the chassis, making it seem like the tablet has ‘ears’. This also takes away from the fluidity of the bezel of the screen. The tablets sports a Plane Line Switching (PLS) TFT capacitive touchscreen with approximately 149 ppi density, making the resolution on the screen not that great. The company has managed to put excellent viewing angles on the device but it still has a lot of reflective ability, making it harder to work under direct sunlight. The Wi-Fi model is powered by 1 GHz Dual-core Cortex-A9, while the Wi-Fi + Mobile model is powered by 1.5GHz, Dual-core Krait Qualcomm processor. Both the models offer 1 GB RAM. The device is a bit jerky in responding and is a little slow when switching between home screens. The Wi-Fi model comes with Android 4.0 Ice Cream Sandwich, while the Wi-Fi + Mobile comes with Android 4.1 Jelly Bean, but fear not the Wi-Fi model is upgradable to v4.1. Samsung has also added a screenshot button to the soft buttons at the bottom of the screen. When in landscape mode, the device houses five features on the top of the device: a volume rocker, microSD slot, power/sleep button, an IR blaster, and a headphone jack. The camera sans flash resides on the back, while a dock connector and microphone pinhole are at the bottom of the device. The device offers a 3MP rear camera and a VGA camera for video calling. The rear camera offers decent images, though they images may be grainy when not taken in adequate lighting. The Wi-Fi model offers various camera features such as: Shot Modes Effects, ISO, Scene mode, Shooting mode, White balance, Camcorder, HD Recording and HD Playback. The device also has video taking capability. The tablet is available with 16/32 GB internal storage capacity that is upgradable by 32GB. The Galaxy Tab 2 10.1 houses a powerful non-removable Li-Po 7000 mAh battery, providing a good battery life compared to many other tablets. The device comes with already loaded Samsung apps, while other apps can be downloaded from the Google Play. The information for the detailed table about the two phones has been taken from the Samsung website, expertreviews.co.uk and GSMarena.com. EDGE, GPRS, LTE, Bluetooth, Wi-Fi and USB. GPRS, EDGE, WLAN, Bluetooth, USB, USB Host, Wi-Fi Hotspot.